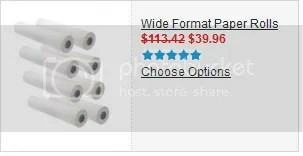 Large Wide Format Roll Paper on SALE down to $9.99 a roll WoW!! Large, Wide Format Plotter Paper Never smearing or smudging of ink our top quality inkjet papers unroll straight and even for a quality print the first time. All Inkjet rolls are produced on a 2” core. Each wide format paper roll is lint free, sand, grit and dust free, and protectively sealed for long term storage. You can order Wide Format Inkjet Rolls from us with total confidence that you are receiving PREMIUM QUALITY products at a GREAT PRICE. 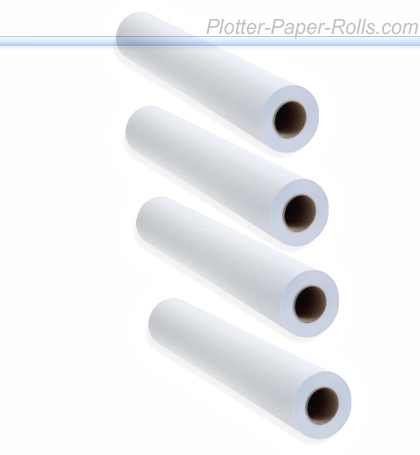 Our plotter paper rolls are in stock and ready for same day shipping in most cases. Also, with our 26 warehouses, anywhere in the USA is 99% covered to have 2 day ground shipping. Wide, Large-Format Paper is what wide format printers run on. Depending on what job you are doing you can print on paper, plastic, vinyl, Mylar and more. Large HP wide format paper rolls offer a very high quality of printing without any additional printing services. You can easily print your ideas, complex designs, displays, posters etc in very high quality. HP paper rolls are come in variety of sizes and can be cut into your required size. It includes bond papers, photo paper and some other variety of papers and you will definitely able to get your size of large, wide format paper. Our papers come in standard sizes for HP inkjet and other printers and serving the people for over 129 years in all over the world. Wide format paper rolls are used to bring your big ideas onto the paper. 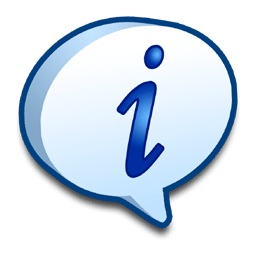 It is used for personal projects as well as for professionals and business level projects. There are different kind of wide format paper rolls are available such as 20 lb wide, large-format paper rolls, 24 lb wide format paper rolls, and wide format inkjet paper rolls etc. These paper rolls are generally used for media printing, high quality presentation of your idea, complex engineering designing etc. A high quality wide format paper can easily take your ideas to the next level. There are different types of wide format paper rolls are available in the market. You can choose from this variety depending on your use of these papers. Wide format inkjet paper is large in its size and can be cut into pieces according to your requirement. These are the idle input papers for standard inkjet printers like HP, Oce, Epson, Canon, and Encad etc. The papers can be used for architect plans, designing, engineering plans, blueprints and artistic use etc. The wide format rolls are bagged and sealed to protect in from outside environment; mainly moisture, heat and sunlight. It can be then packed into cartons for normal shipping purpose. Wide format paper rolls also used in engineering purposes. When you need high accuracy and consistency in your work then these papers become very much useful. You may need these papers in bond, mylar as in double matte mylar plotter paper rolls, film and vellum that keeps your work for a longer time and offers high efficiency. It looks like original even after transferring from one place to another. Its weight, smoothness and brightness become constant every time. These are some of Wide Format paper rolls varieties available these days. Other than this collection you can also find many more types of wide format papers. These papers are mainly used for engineering designs, architect plans, complex ideas, media printing and many other works. HP wide format paper rolls provide a very high class printing and take your ideas and presentation to very high level. The 20 lb and 24 lb wide format papers are also available in the market. These papers are used as input for inkjet printers of all branded companies. Richard R.